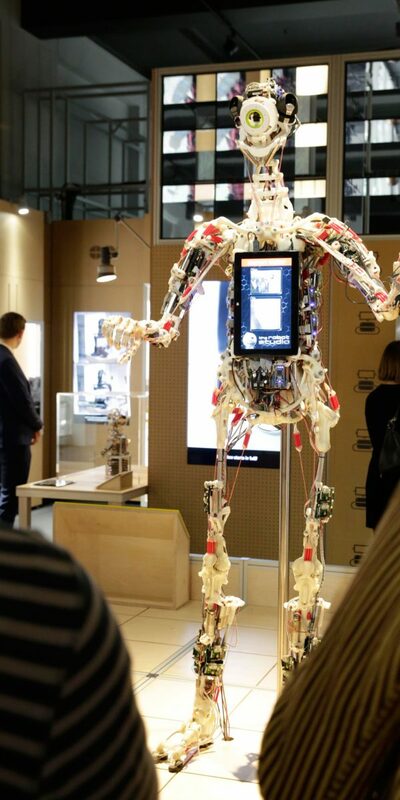 We envision a future where robots in daily life are as ubiquitous as websites are to the internet, with the power to automate placed in everyone's hands. 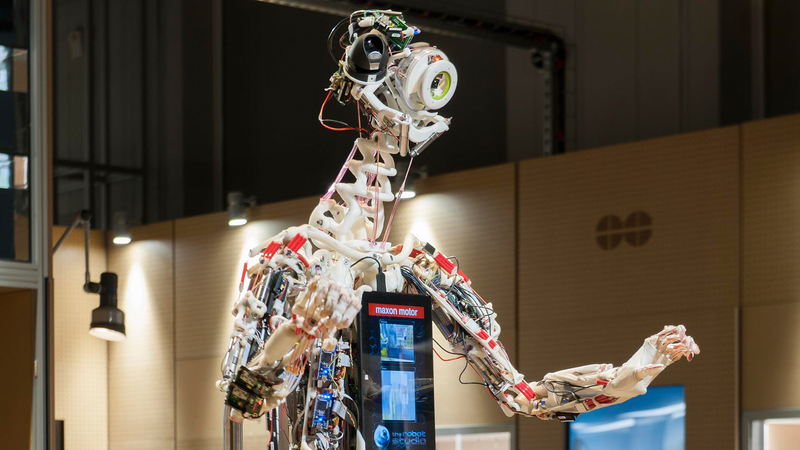 Our immediate goal is to help accelerate the development of an open-source, general-purpose humanoid robot that can turn its hand to a wide range of human centric tasks. 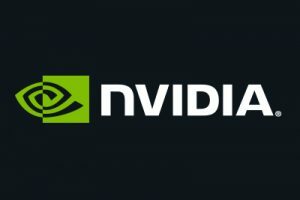 Our contribution to this global effort is the development and support of an open-source hardware platform that offers higher performance at lower cost by integrating innovative mechanical designs with the latest NVIDIA powered AI-at-the-edge solutions. 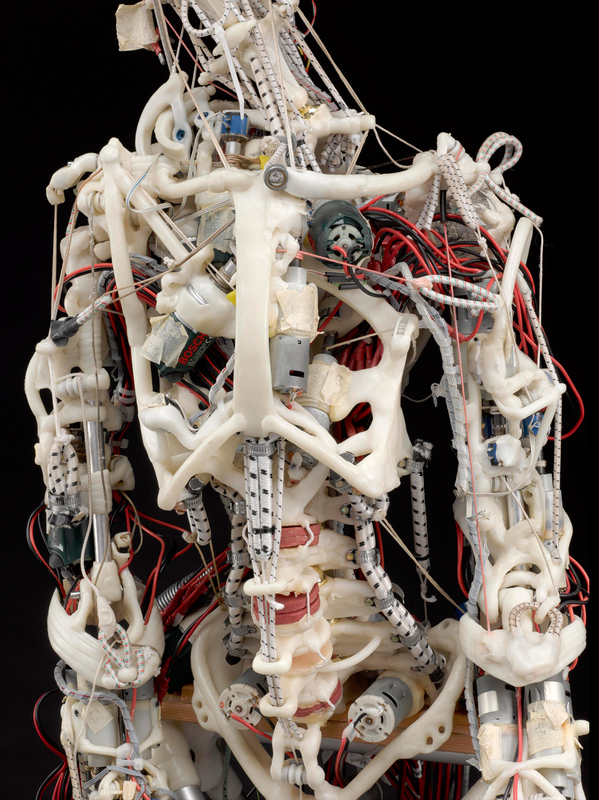 For more than a decade we have created extraordinary robots based on the functional anatomy of the real human body. 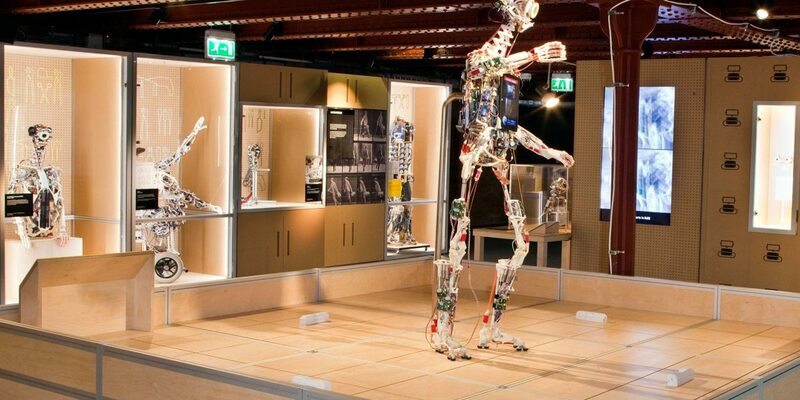 Unlike the stiff, heavy machines of industry our robots have a bounce to their movements that gives them a naturally pleasing style of motion. 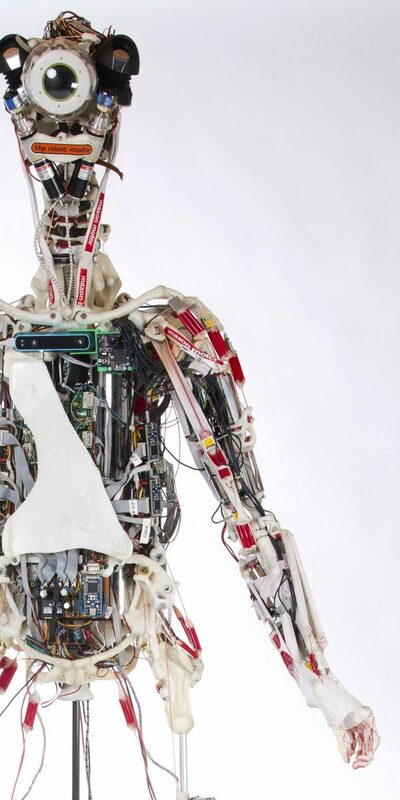 Springs placed in-line with every tendon and in every driven joint produce a compliant mechanical structure that allows the robot to naturally fit into its surroundings, just like we do. 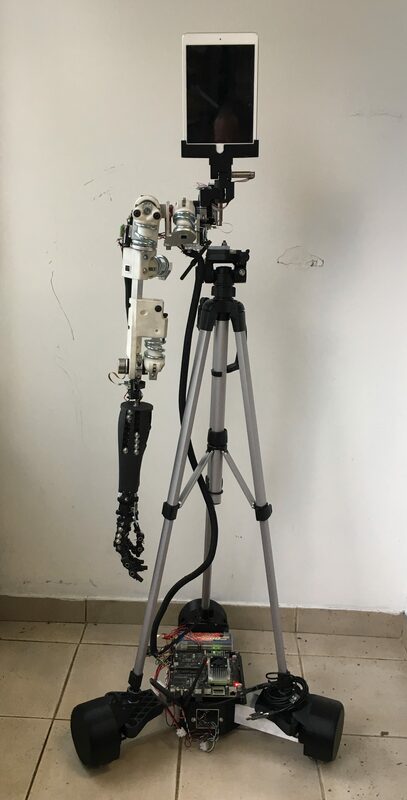 Instead of the precision of industrial robots to blindly execute tasks we rely on computer vision, tactile feedback, simulation and NVIDIA powered AI to produce the next level of robot performance. 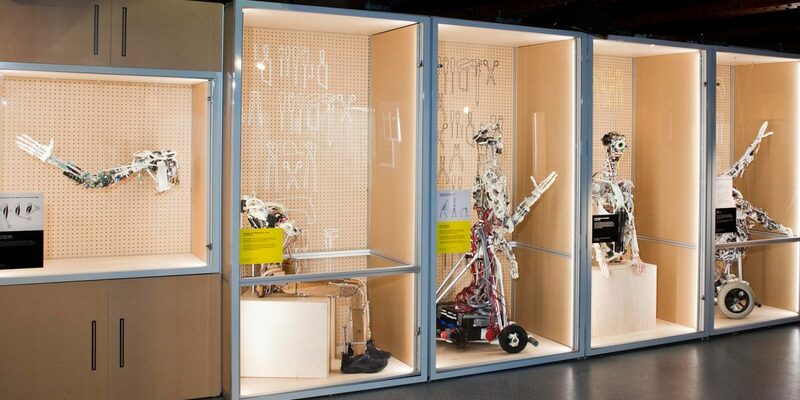 A more human approach for a robot that can work next to people. 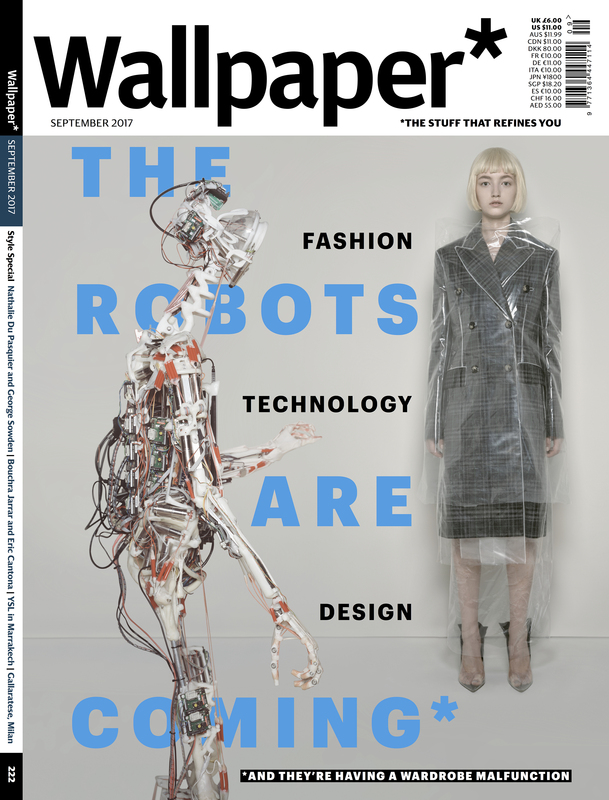 The September issue of Wallpaper was a fashion issue with ROSA featuring in a story by Brigitte Niedermair. 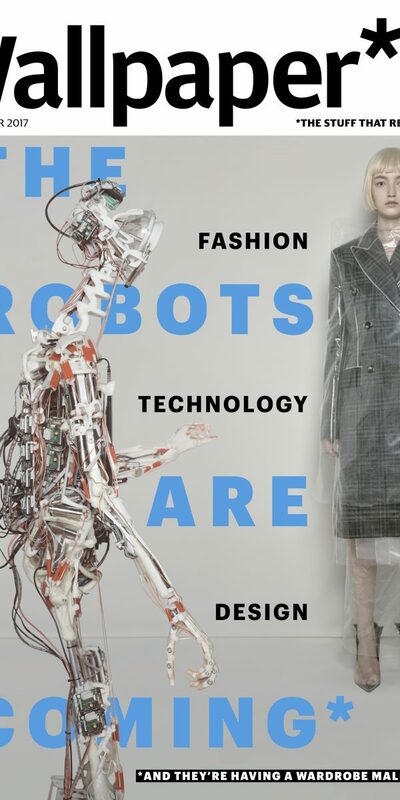 It wasn’t a classic fashion shoot however and the Robots definitely have prominence. Previous stories with Brigitte have tackled subject matter as diverse as molluscs to ’ugly’ vegetables. 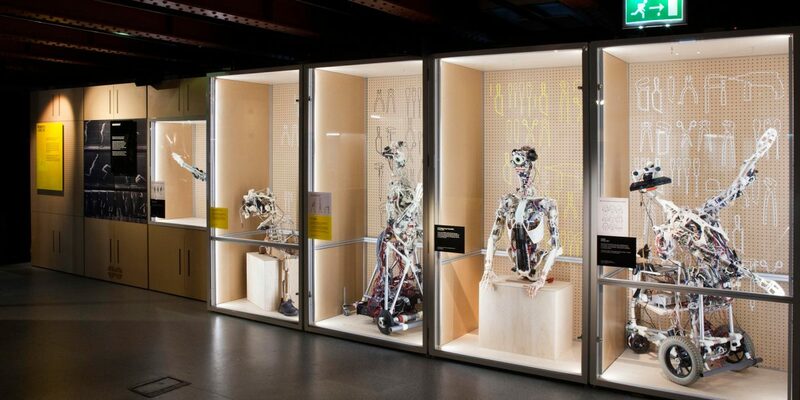 ROSA, as this robot was dubbed by the London Science Museum, is our most anatomically complete robot to date. 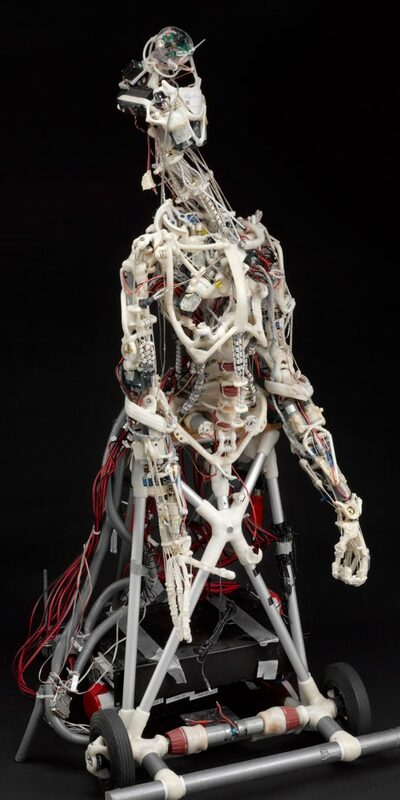 She features accurate ankles, knees, hips, shoulders, elbows, wrists and hands with over 80 powered degrees of freedom. 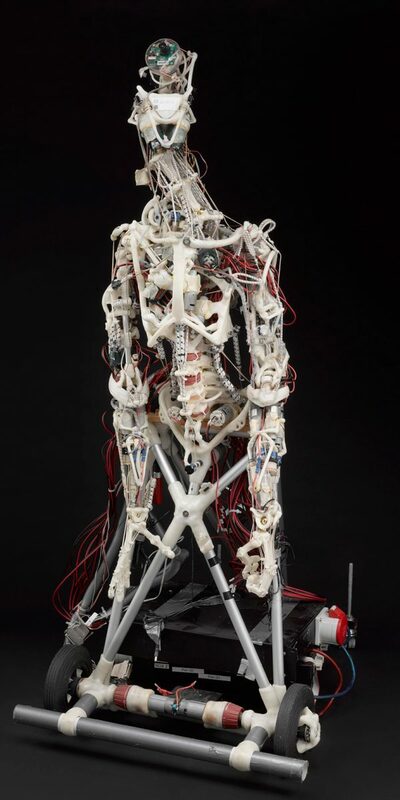 Major muscles are represented with bright red polyurethane springs attached to dyneema tendons that are pulled by powerful servo motors supplied by maxonmotors of Switzerland. 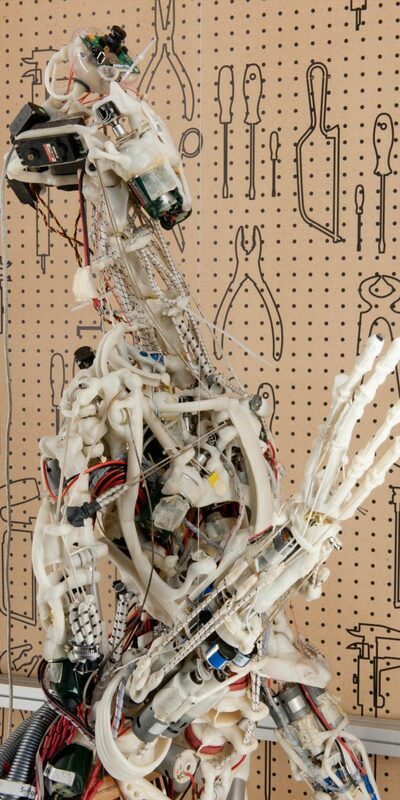 The instructions to make the hand are available on youtube. One of our most popular creations, this pair of arms and distinctive head with face tracking eyeball was our first robot capable of perceiving and imitating the gestures of anyone standing in front of it. 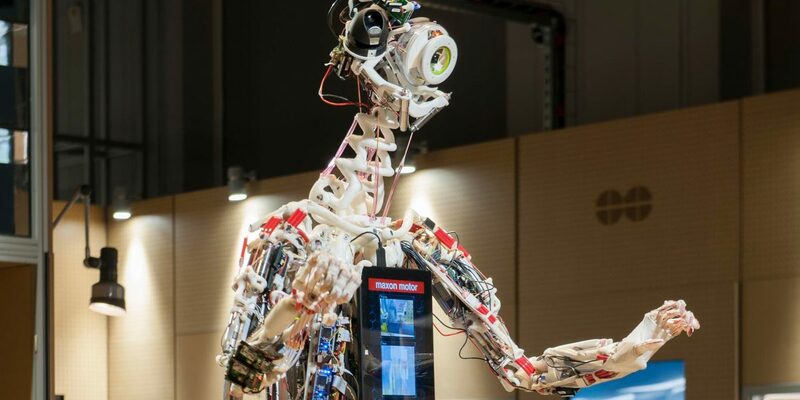 In the best robot building tradition we finished it at 3am the night before flying to the world's largest industrial fair for presentation on the maxon booth where we stole the show with crowds of people lining up for a chance to meet the robot. 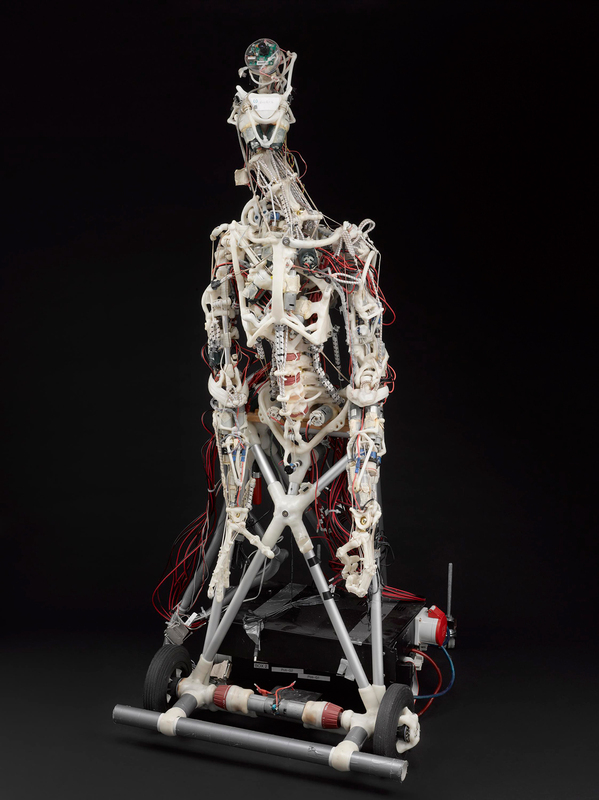 Built as an in-depth study of the anatomy of the human shoulder, this is the only robot we know of that features shoulder blades that glide over a thoracic rib cage. 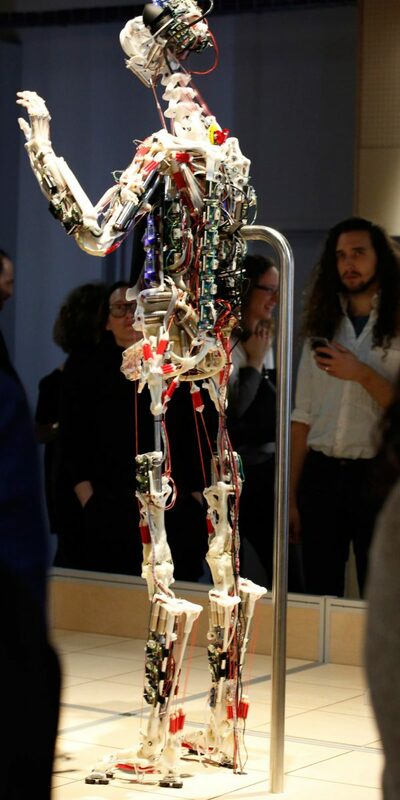 This arrangement gives a much greater range of motion meaning this is our only robot that can high five properly - a vital life skill for any companion robot. 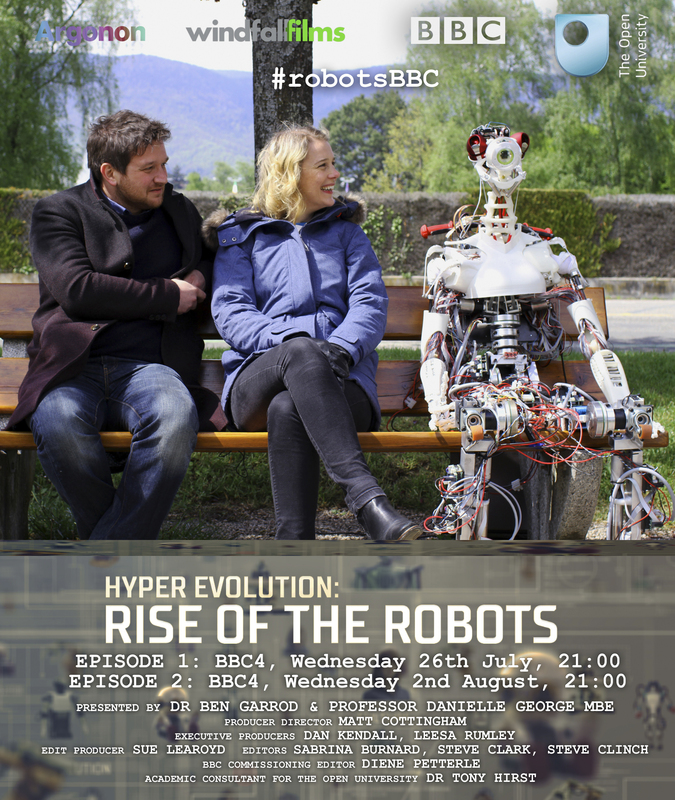 Windfall films produced this BBC documentary charting the rise of robots as they start to more from laboratories into everyday life. 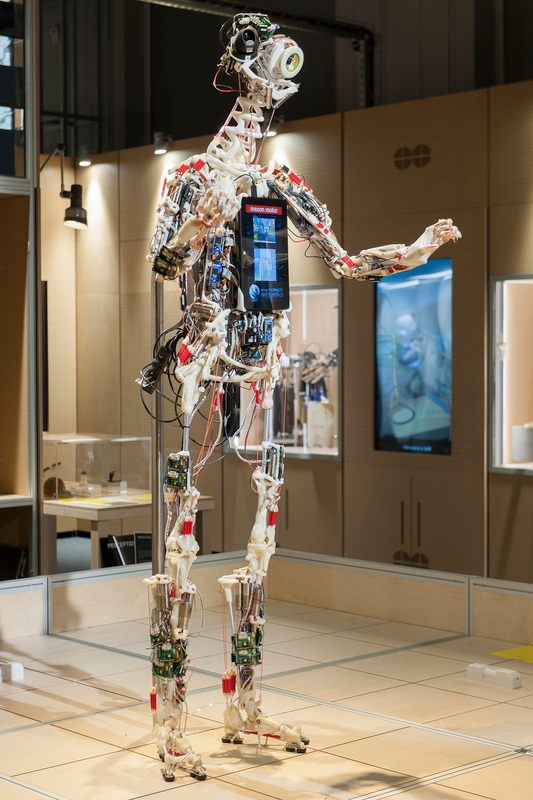 Our robots featured alongside such greats as Boston Dynamics, NASA and Hiroshi Ishiguro's Gemonoids. We were thrilled to be used for the promotional poster when we literally took the robot out of the lab for the first time and down to a nearby lakeside park. Here we see a mix of parts. 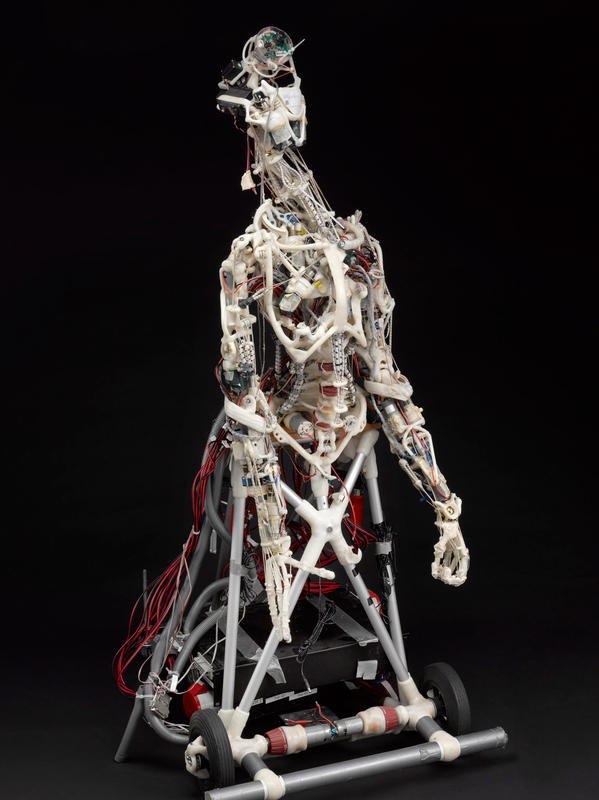 To kickstart the ECCERobot Project CRONOS was repaired and refitted to become the ECCE1 and was eventually mounted on to a mobile frame. 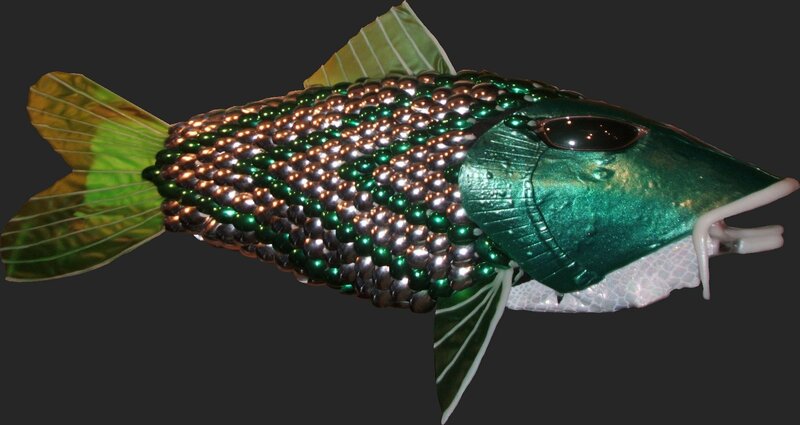 After the EDS was built the original CRONOS head was transferred and a replacement made with much improved optics. 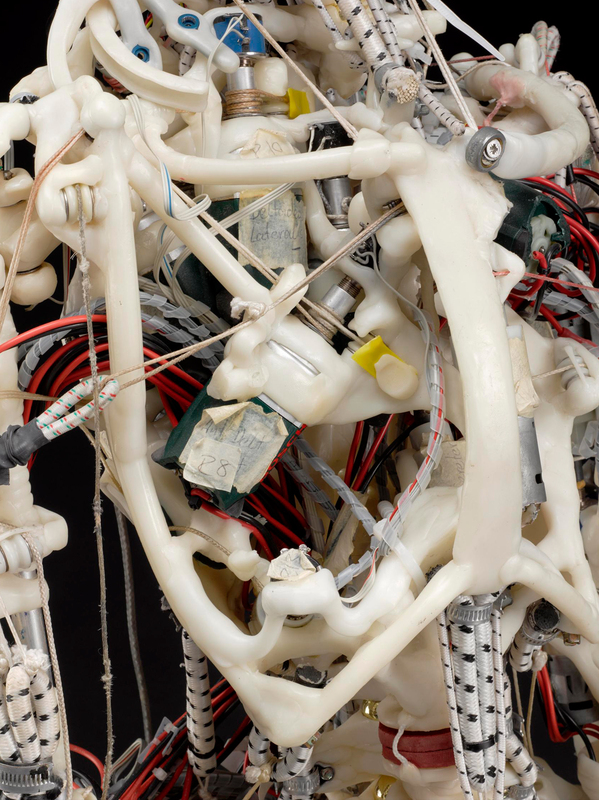 A close-up of the torso reveals a mix of motors and anatomical details. The motors still in their green casings have been repurposed from Bosch IXO powered screwdrivers whereas the motors that are bare have been extracted from generic consumer powered screwdrivers. 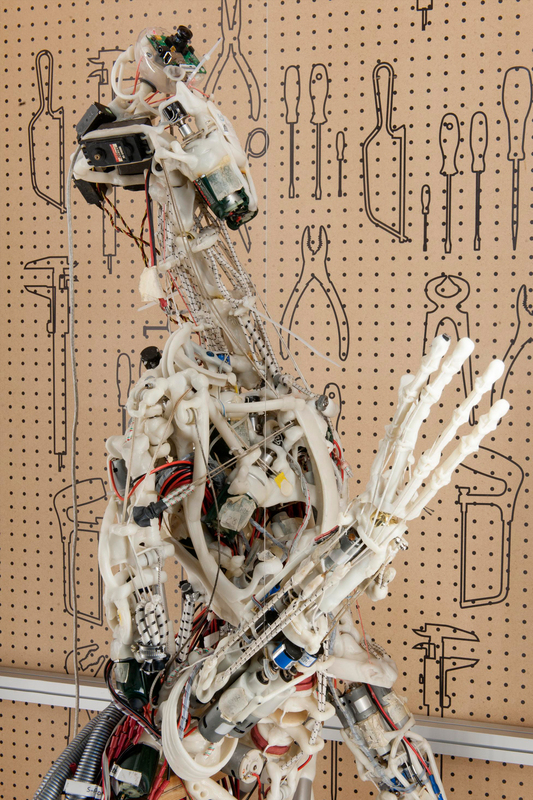 At one point we bought the entire surplus stock of a large DIY chain - over 130 screwdrivers to be turned into robots! There are also differences between the fixed right shoulder and the articulated collar bone of the left shoulder that would eventually form the basis of the gliding shoulder blades in the EDS torso. 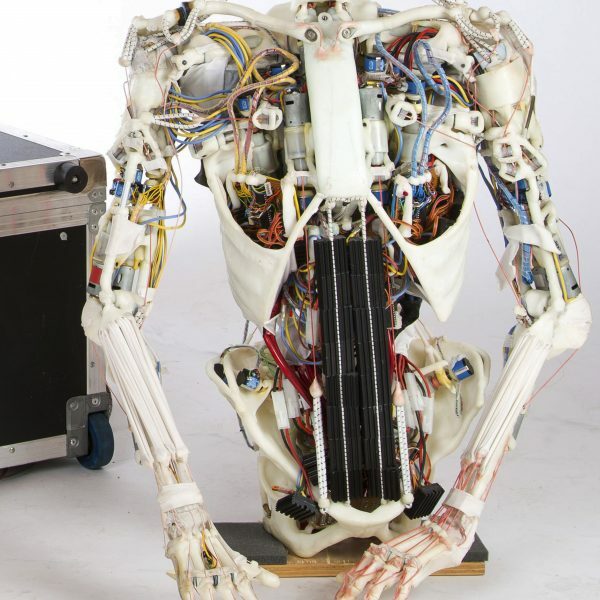 The ECCE1 robot consisted of a repaired and refitted CRONOS torso fitted to a new mobile base with a new head incorporating an HD camera for vision experiments. 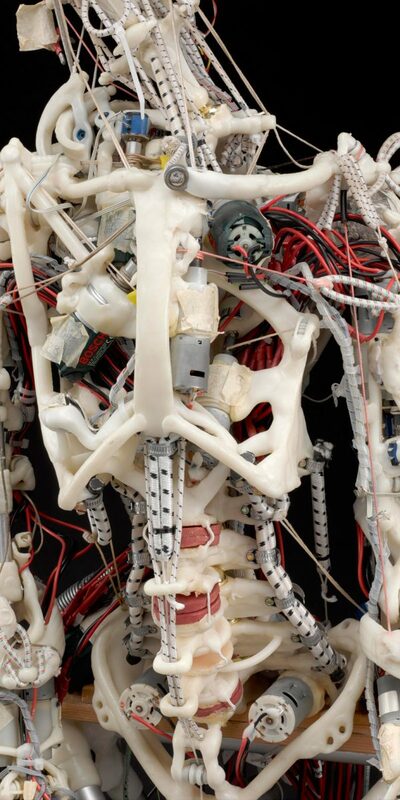 The original head was moved to a succession of torsos before being replicated in 3D printed parts when that technology became widely available. A close up of the left side of the chest showing a fixed shoulder and several muscle attachments. In this design we used loops of latex bungee shock cord as the spring element which gives a very pleasing characteristic and lasts for many years even under continuous tension. 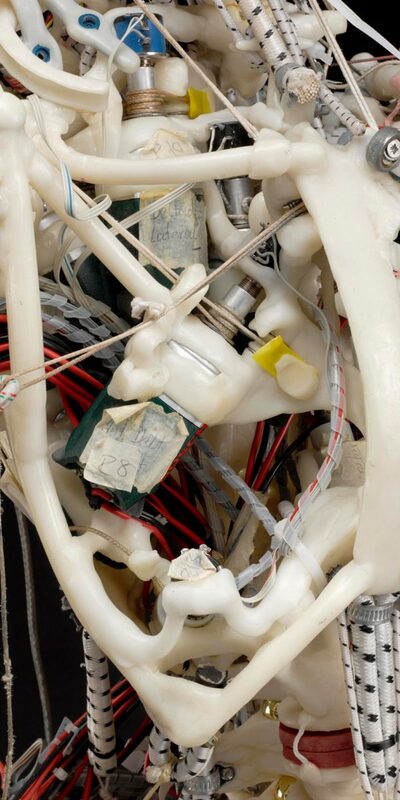 Note the arrangement of the tendons as they wrap around the gearmotor shaft in the centre of the image. By adding another pulley in the opposite direction to the tendon pull it is possible to eliminate lateral forces on the gearmotor shaft. 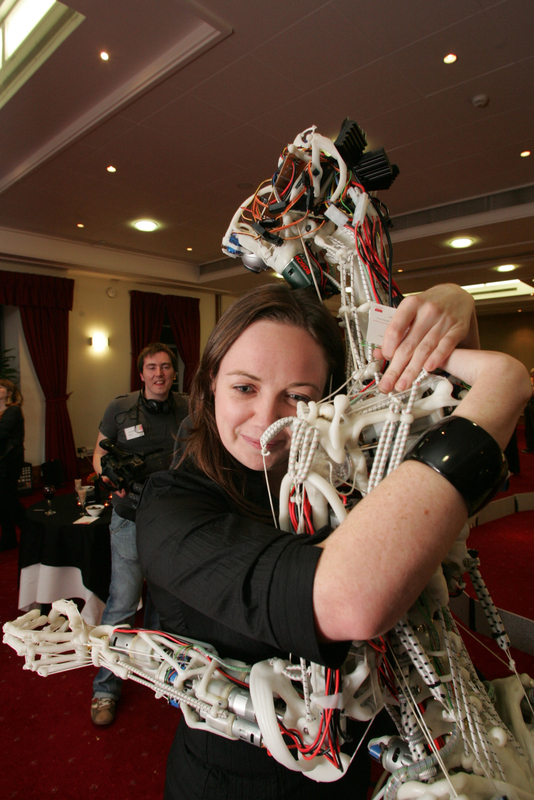 Google "Robot Fish" and you'll still find an image or two of our original free swimming robot fish demonstrated for the first time in 2005 for the opening of the London Aquarium. 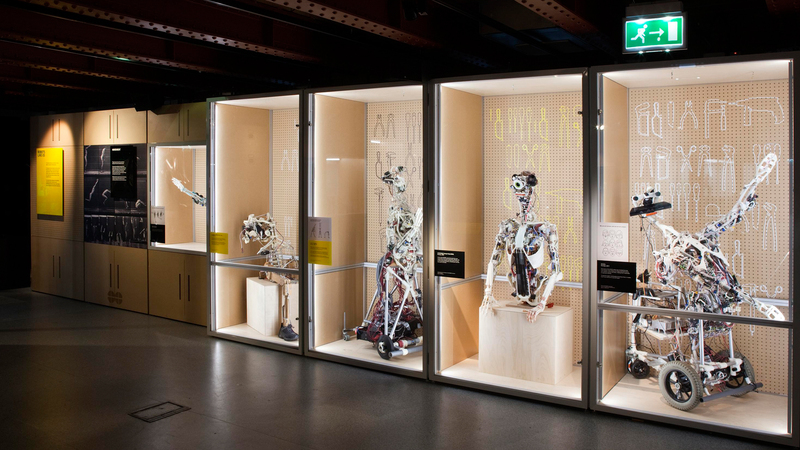 We are honoured to be part of the ongoing Robots Exhibition curated by the London Science Museum which opened in London in 2017 and will tour the world until 2022. 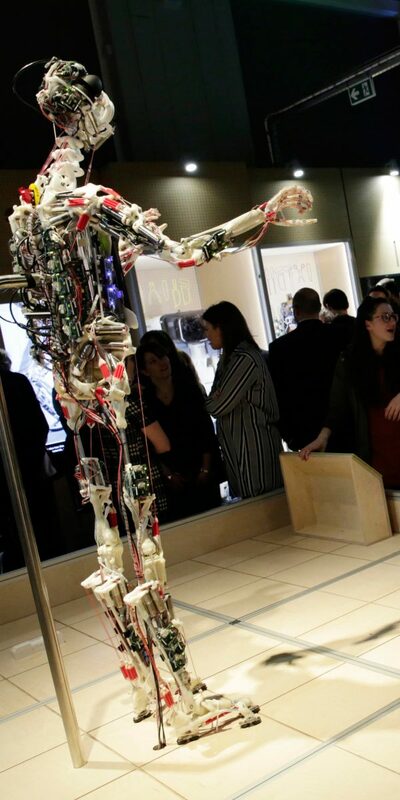 This blockbuster exhibition gathered together an unparalleled collection of 17th century automatons through to modern industrial robots and sci-fi staples like the Terminator through to cutting edge robots like our own ROSA. 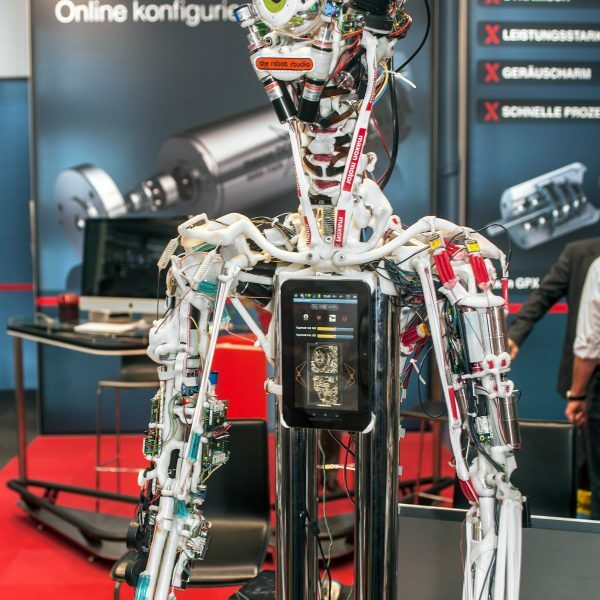 Most gratifying for us was that they managed to gather almost all the robots of the CRONOS and ECCERobot projects in the same place for the first time ever to present a showcase of how our robots developed over time. 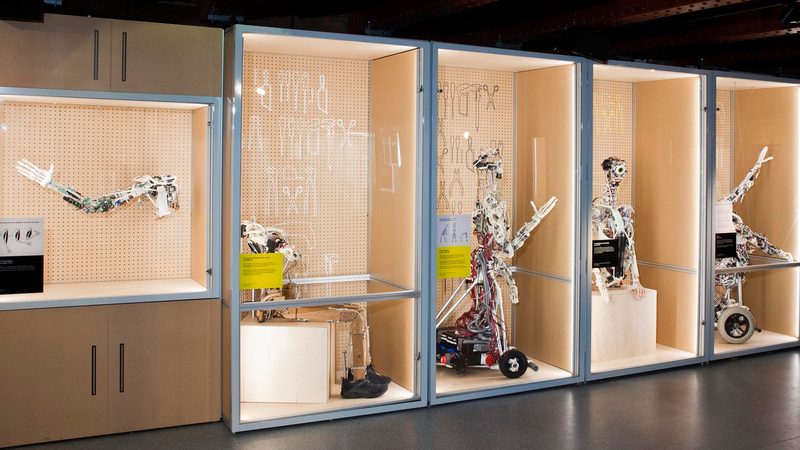 From left to right display cases show a prototype arm, the pre-prototype of CRONOS, ECCE 1, EDS and ECCE 3. Centre stage ROSA is ready to interact with the crowds through face tracking and random gestures played every few seconds. A close up of ROSA showing the tablet mounted on her chest which displays the face of the last person that she has looked at. ECCE1 ready for some much needed repairs! ROSA stands ready to meet the crowds. She has now stood there for two years and greeted over half a million people! 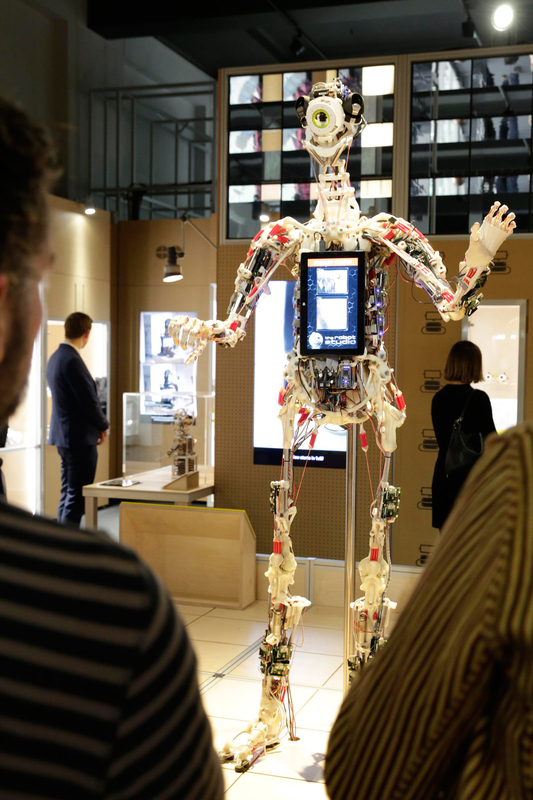 On the opening night people gather round to see this unusual robot with all its mechanisms exposed. Most people are simply fascinated, some have deeper thoughts it seems. ROSA waves a welcome to the exhibition. 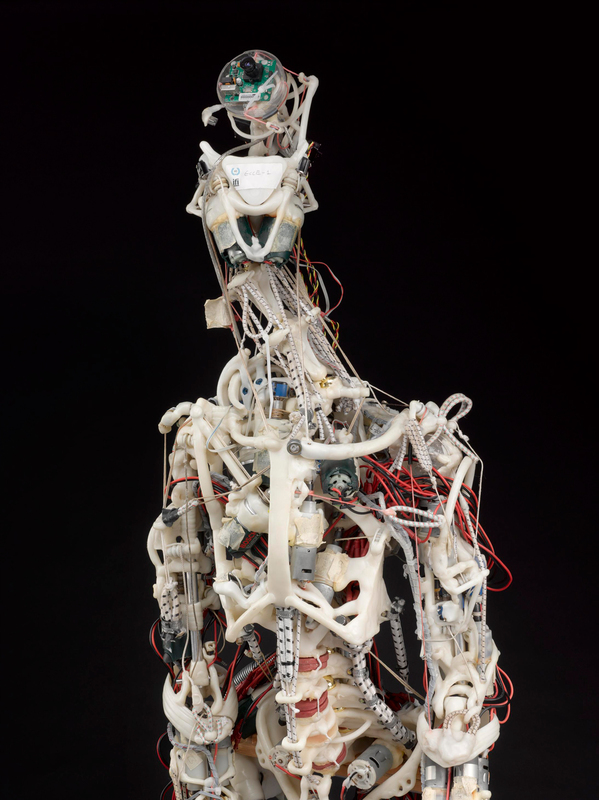 The view from behind shows the structure of the shoulder more clearly and also the banks of electronics needed to control the dozens of motors spread throughout the hands, arms, legs and torso. 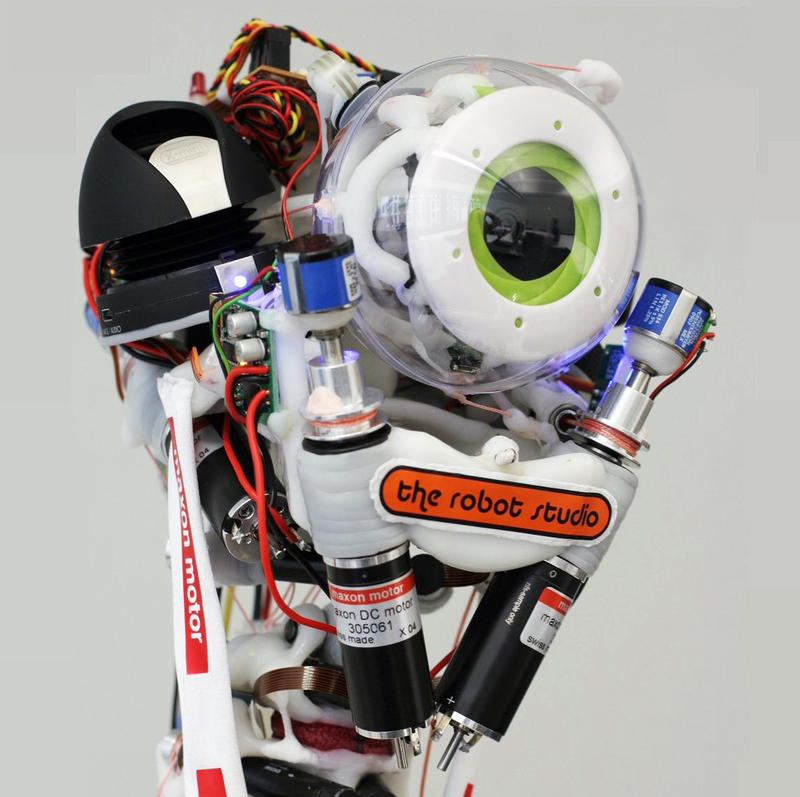 CRONOS was the first of the anthropomimetic robots completed by The Robot Studio. 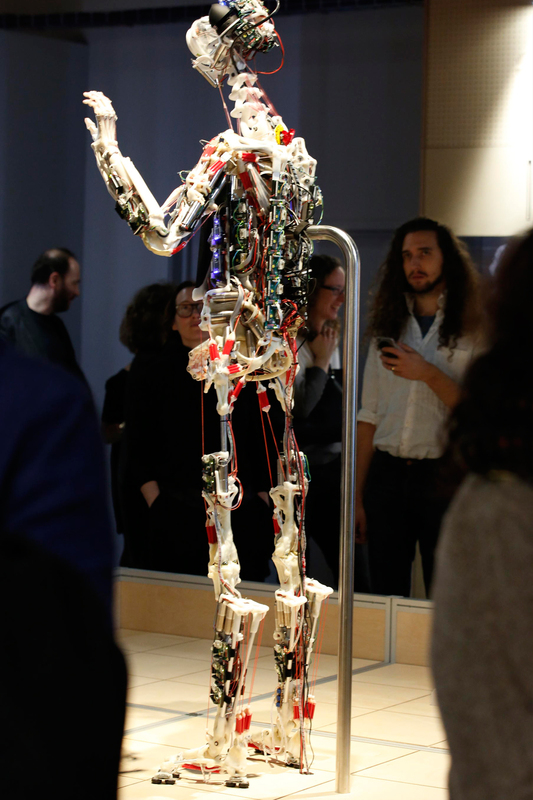 The original intention was to create a machine that was close enough to the human body that controlling it would yield some insight into how the mind and particularly consciousness relate to the physical form. 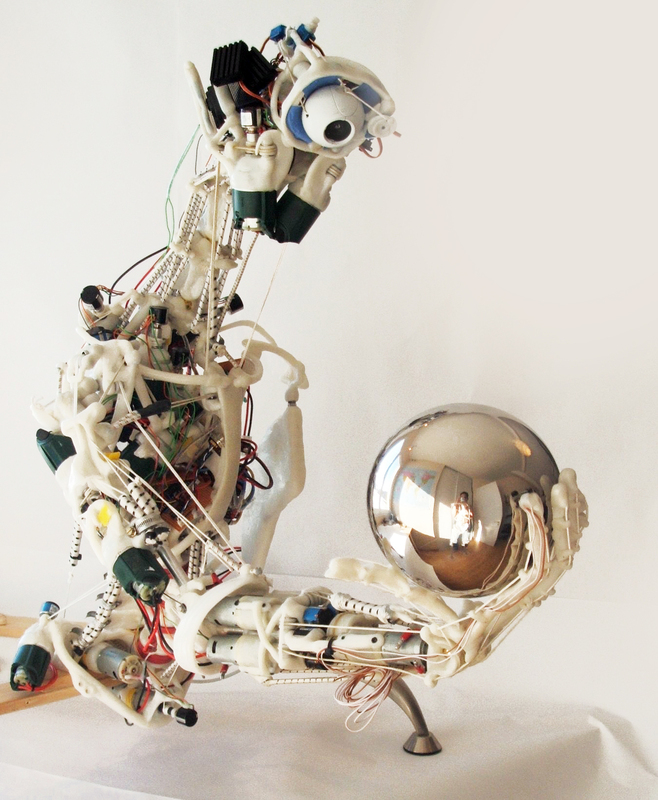 Rather unexpectedly what it ended up producing was a robot that people can naturally relate to just from its movements. Is this is a sphere I see before me? 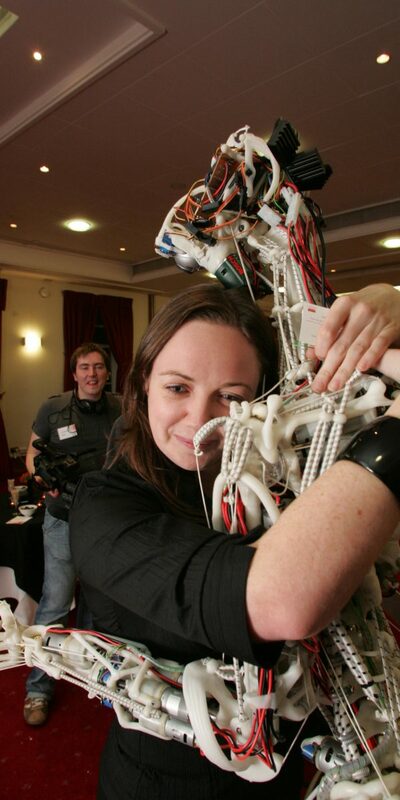 Dr Claire Rocks opened our eyes to a completely unanticipated reaction that people really enjoy hugging this kind of robot. Given that it most closely resembles a skinned corpse this was the last thing we expected yet she was not the last to enjoy a spontaneous hug. 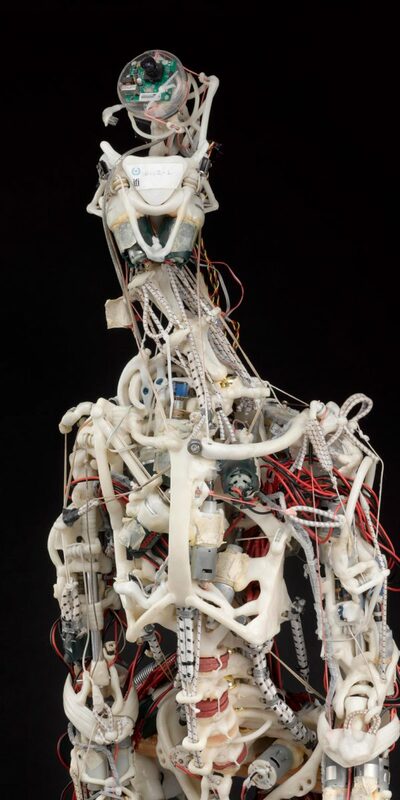 The robot appears to contemplate its own appearance - in reality it's not even plugged in but people just can't help imaging that there is something deeper going on inside. 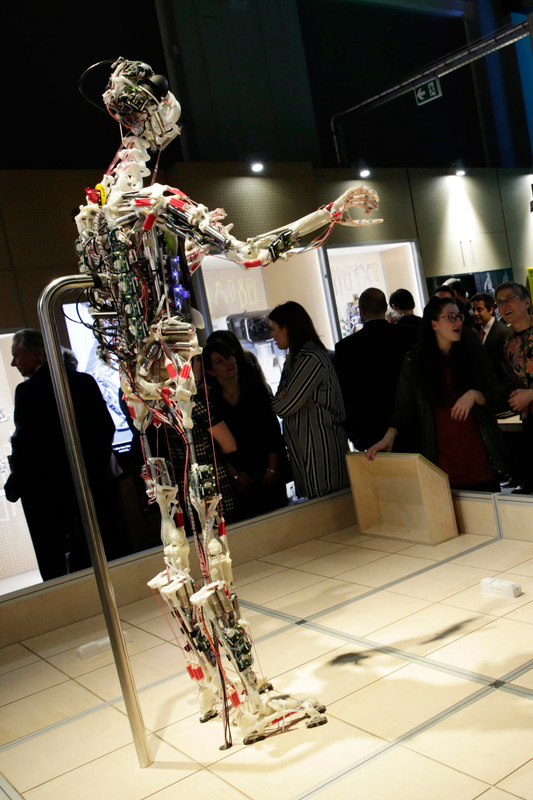 As the convergence of AI, mobile computing, 3D sensors and robotics finally comes to a head we foresee the next stage of intelligent robots emerging from research labs and into daily life. 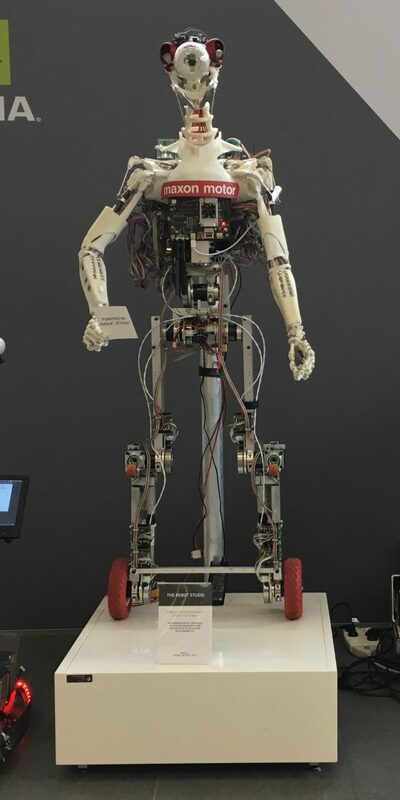 To help with that effort we will be launching a low-cost, high-powered mobile robot platform capable of developing AI applications at the edge. 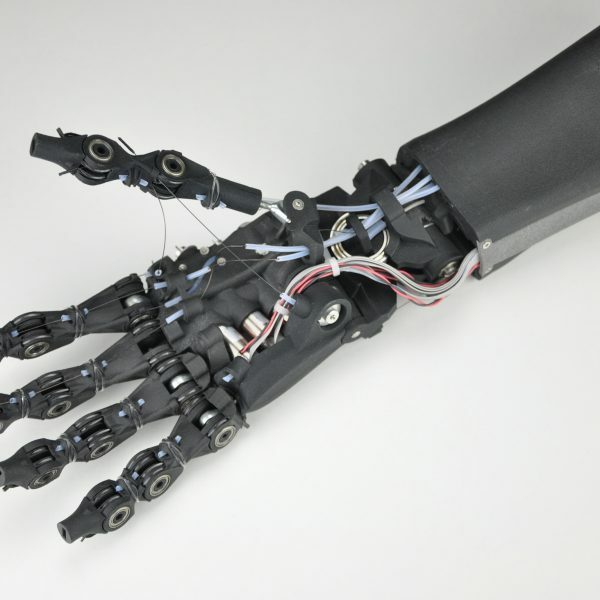 Our most anatomically realistic robot hand to date features up to 21 powered degrees of freedom to give a fully mobile wrist, thumb and forefinger. 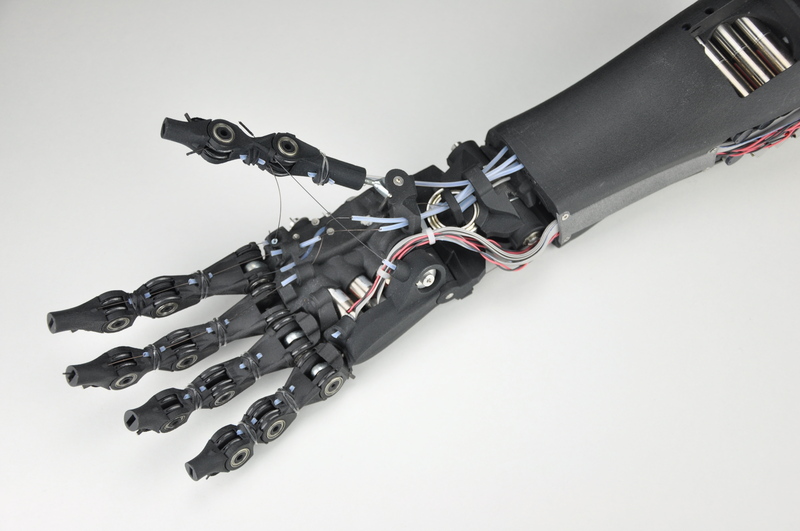 The index, ring and little fingers have reduced mobility compared to human simply because there is no more space for the extra motors required. 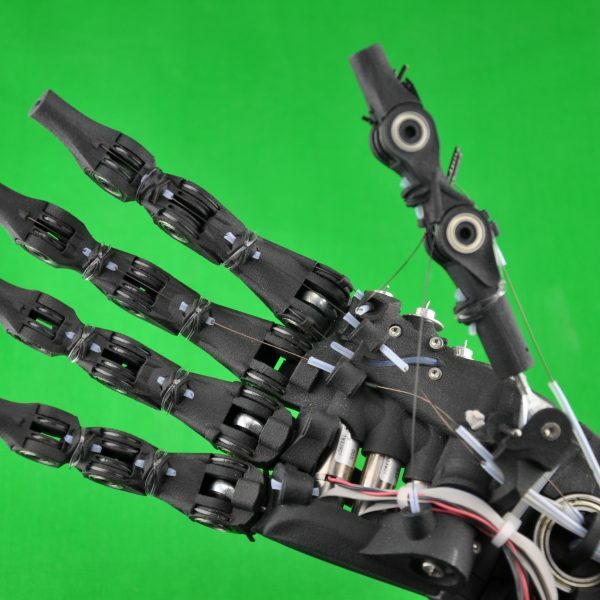 Fully human dexterity requires at least 37 powered degrees of freedom. 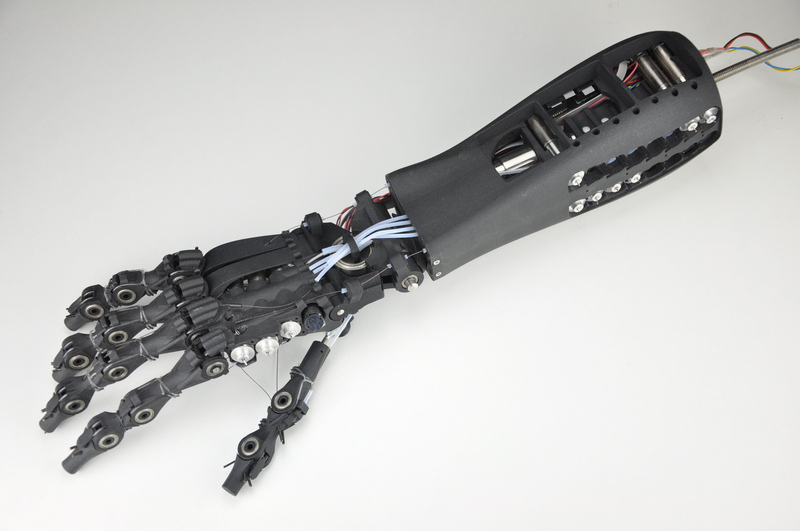 A view of the palm side with just three motors fitted in the forearm. 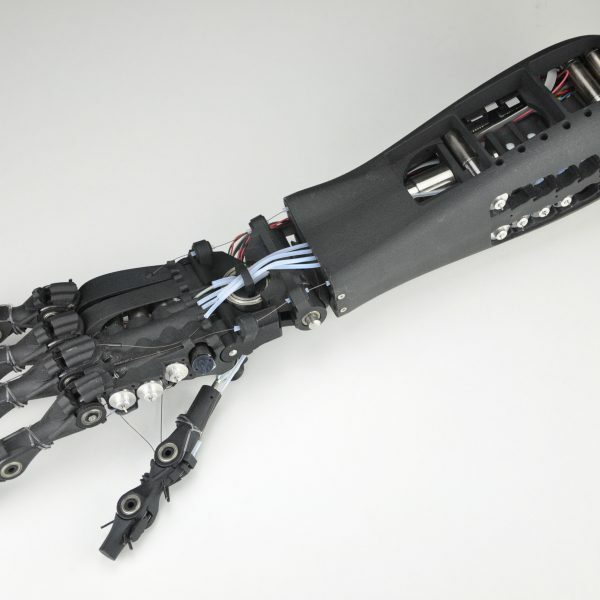 The tendon pathways are printed directly within the forward forearm structure to reduce part count during assembly. 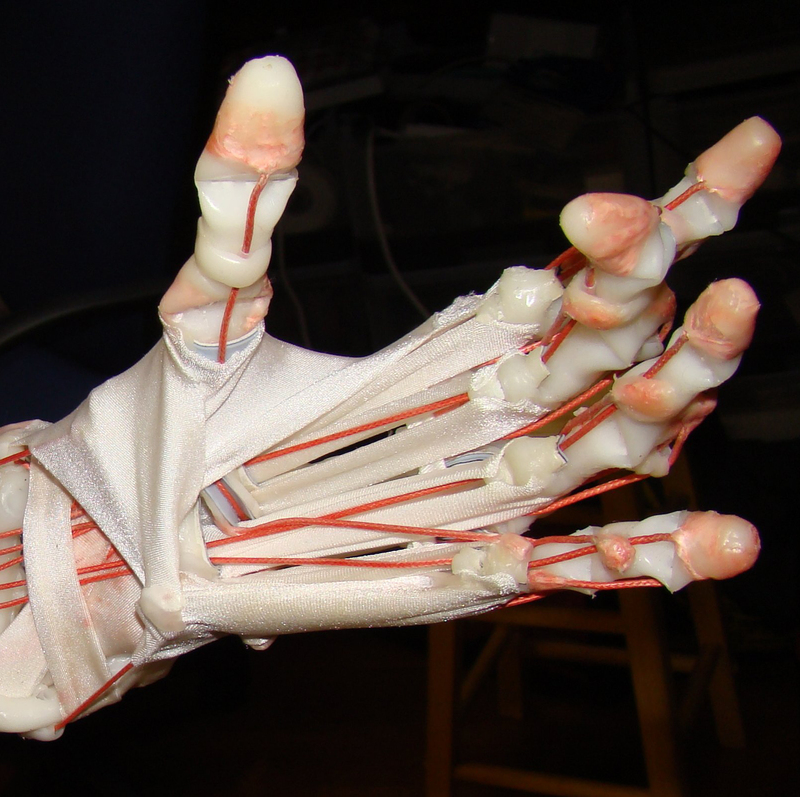 A closer view of the palm side of the hand showing the path of the inner tendons through the wrist joint. 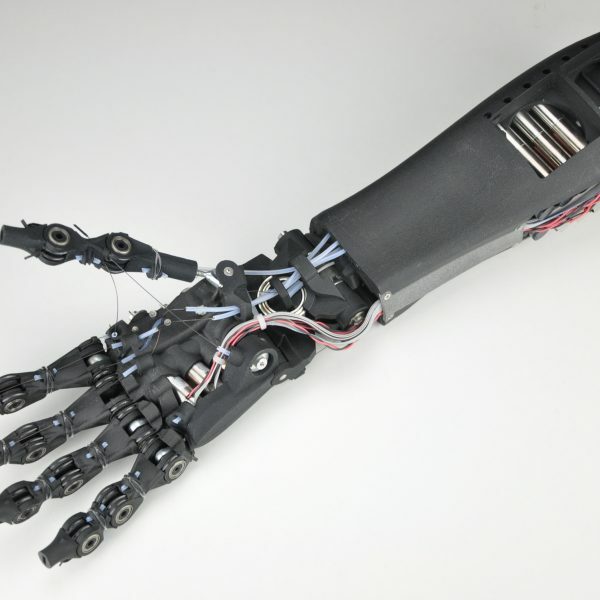 The tendons are sheathed in PTFE liners to reduce friction and extend the life span of the fibres. 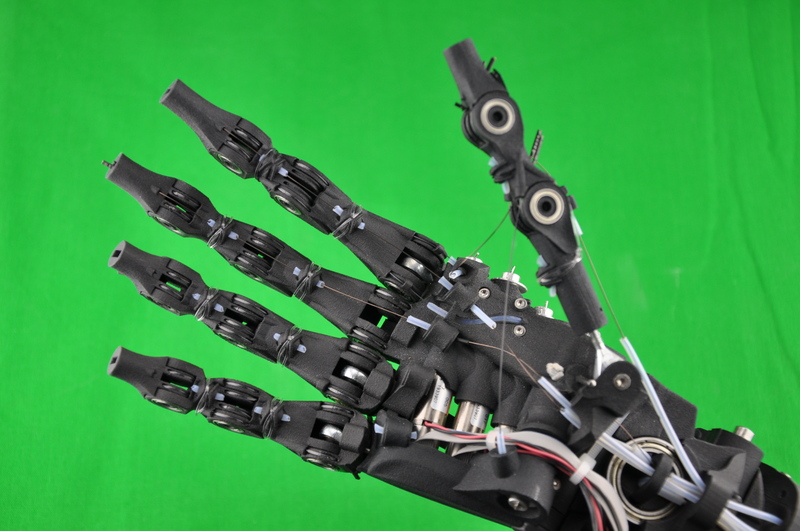 A close up of the back of the hand showing the separate palm sections that link to the ring and little fingers for improved flexibility in the palm. 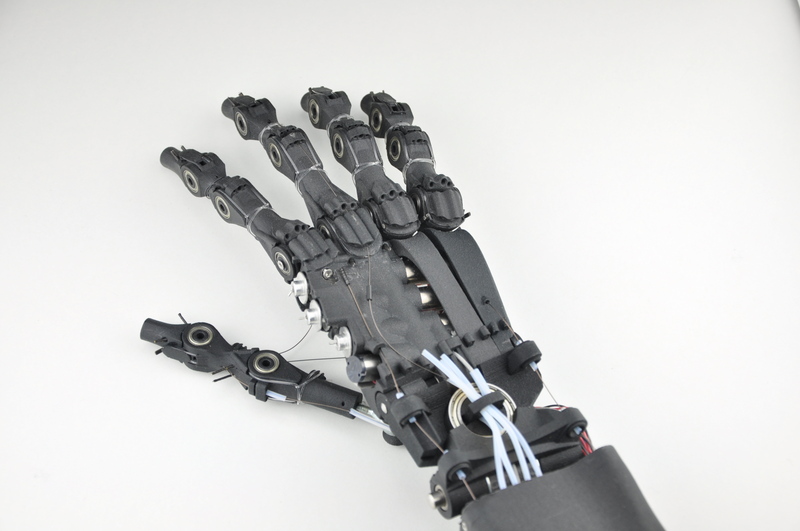 Note the four motors that are embedded in the palm itself that drive the lateral knuckle motions of the forefinger and power the basal joint of the thumb in contraction against the palm. A nice view of the details of the inside of the fingers. 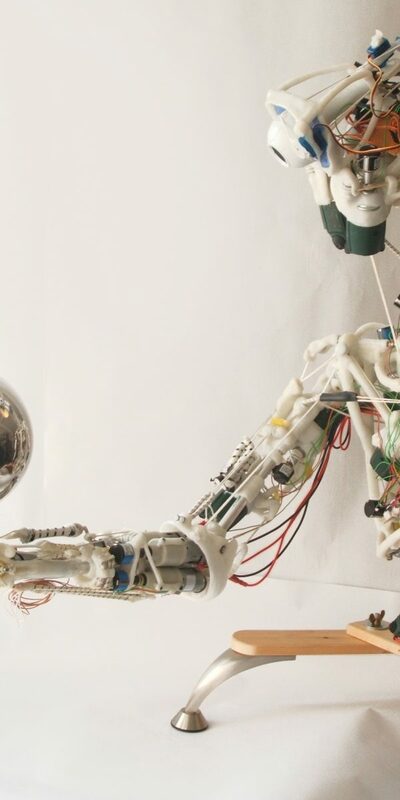 We offer tutorials, support and customisation of all our designs spanning the tiniest details of mechanical assembly and software installation to the grand overview of how to integrate robot systems within society. 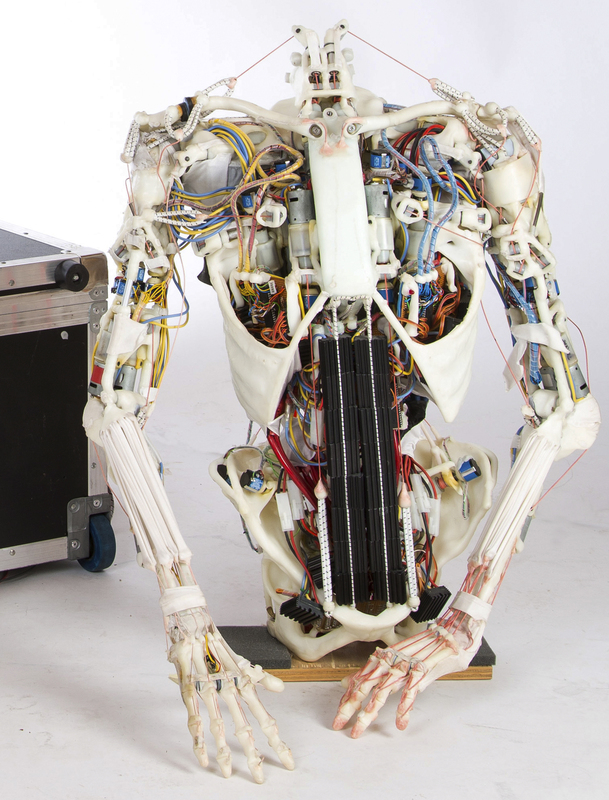 Our expertise in creating robots in humankind’s image is a highly technical artform that we have pursued for over a decade. Our primary expertise is the rapid development and integration of complex hardware and software systems to produce a complete working entity. 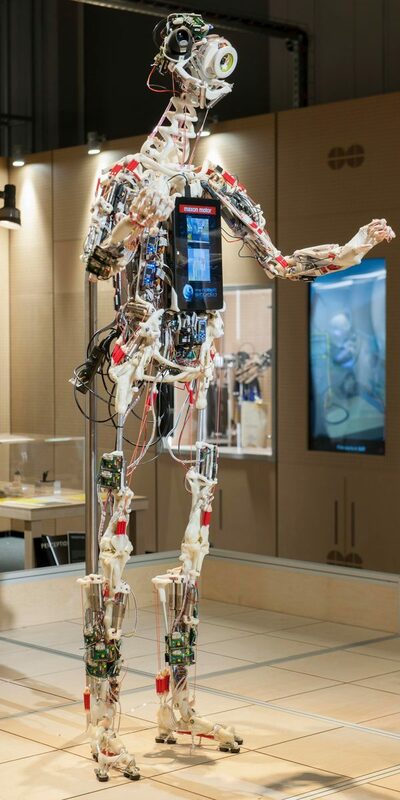 Building a robot that can do the work of a person is a millennia old dream that is finally being realised with the convergence of ever better and cheaper hardware, sensors, computers and AI software. 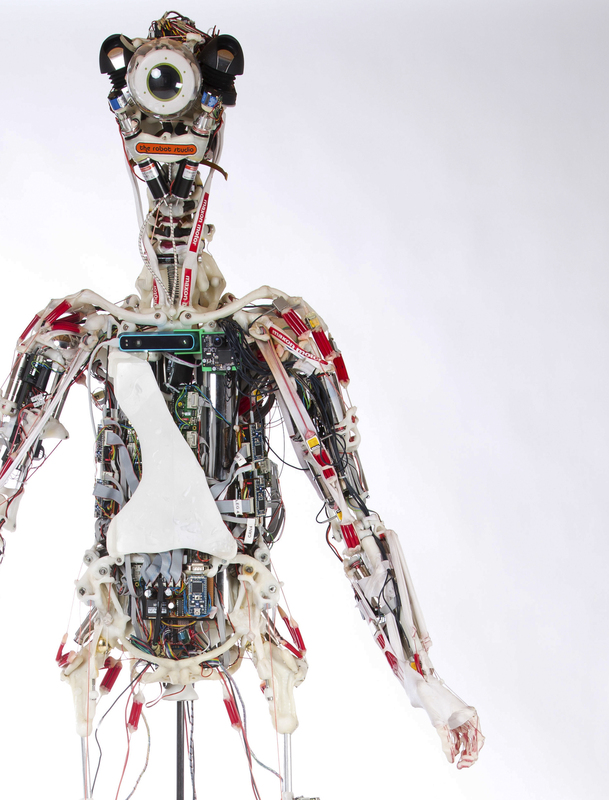 Bringing together all the elements of a robot into a complete working system is the Achilles heel of many robot developments. 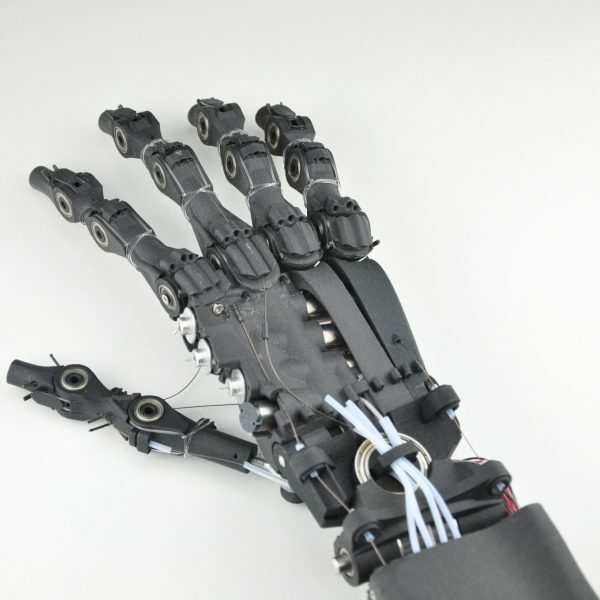 Benefit from our years of experience to bring your robot project to fruition. 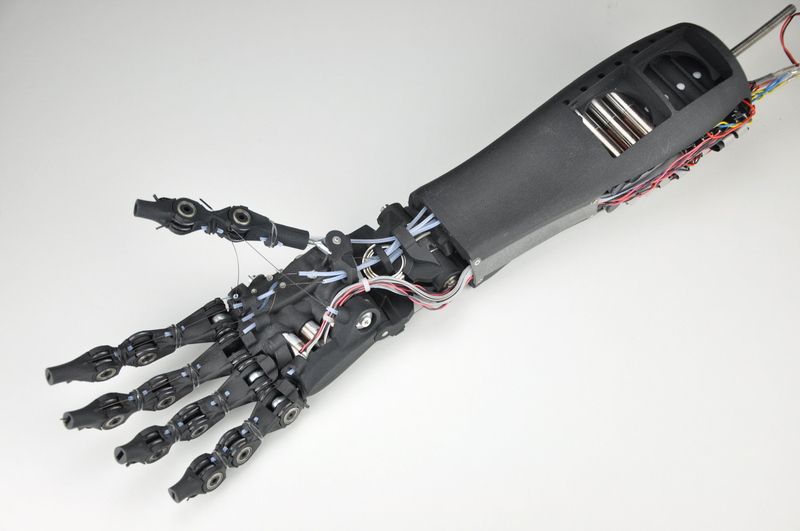 Customised hardware solutions rapidly developed from our unique catalogue of robot designs. 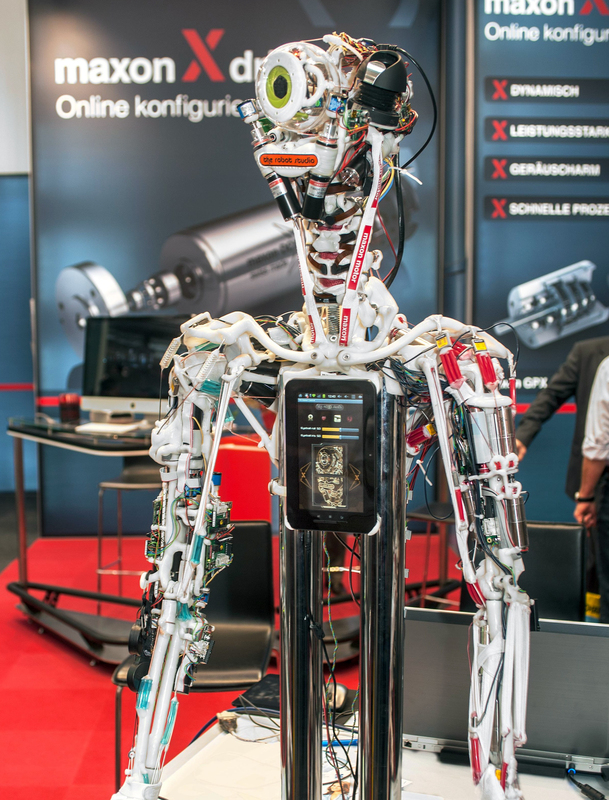 See the new robot era through our eyes and understand how your products can become a part of it. Want to get started straight away? All our previous tutorials are gathered on the opensourceandroid.org website. 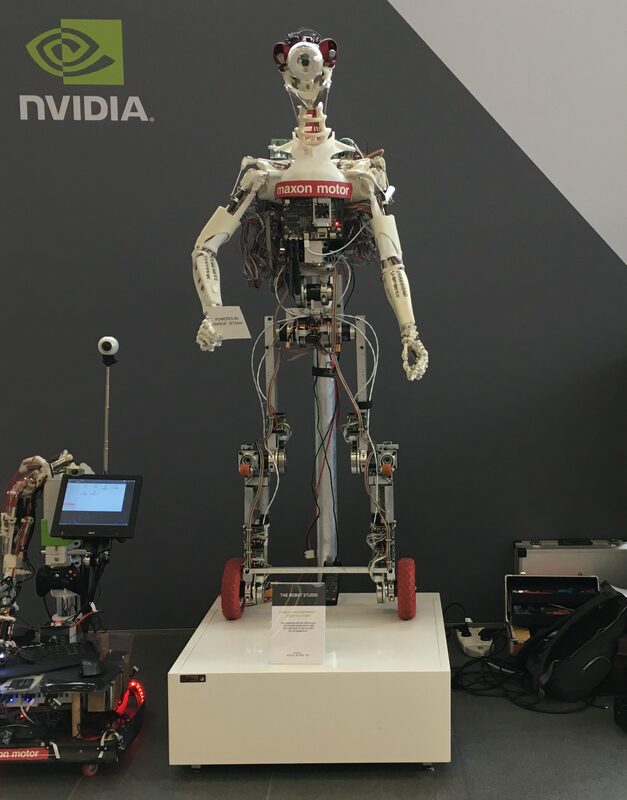 Stay tuned for new content as we launch an open source robot reference platform developed in conjunction with NVIDIA and Silicon Highway in 2019. 1.5 In this policy, "we", "us" and "our" refer to Silicon Highway Limited. 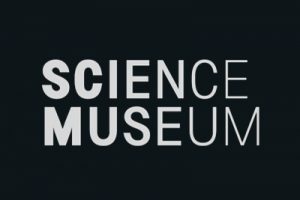 For more information about us, see Section 19. 4.1 We may disclose your personal data to any member of our group of companies (this means our subsidiaries, our ultimate holding company and all its subsidiaries) insofar as reasonably necessary for the purposes, and on the legal bases, set out in this policy. 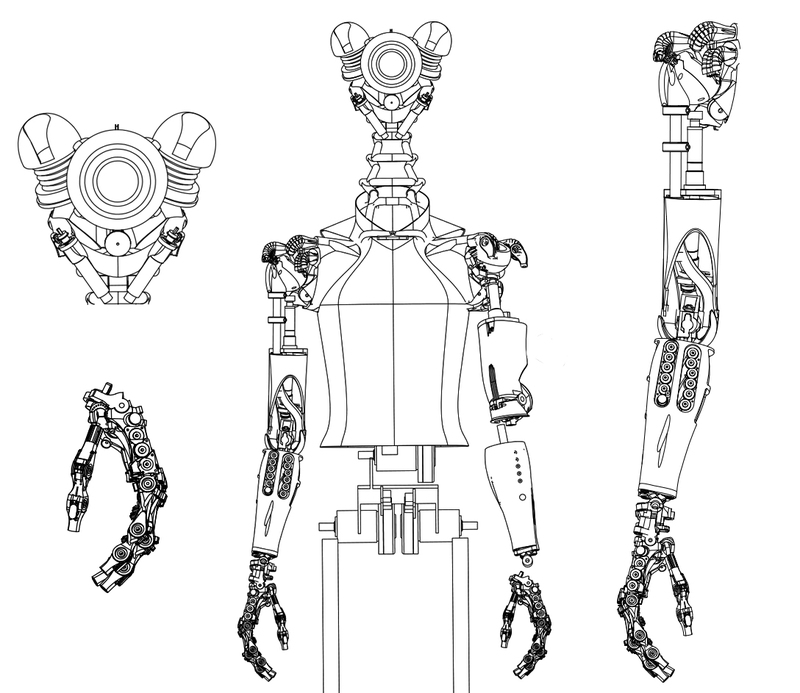 Information about our group of companies can be found at www.therobotstudio.com. 5.2 We and our other group companies have offices and facilities in the UK and Republic of Ireland. The European Commission has made an "adequacy decision" with respect to the data protection laws of each of these countries. Transfers to each of these countries will be protected by appropriate safeguards. 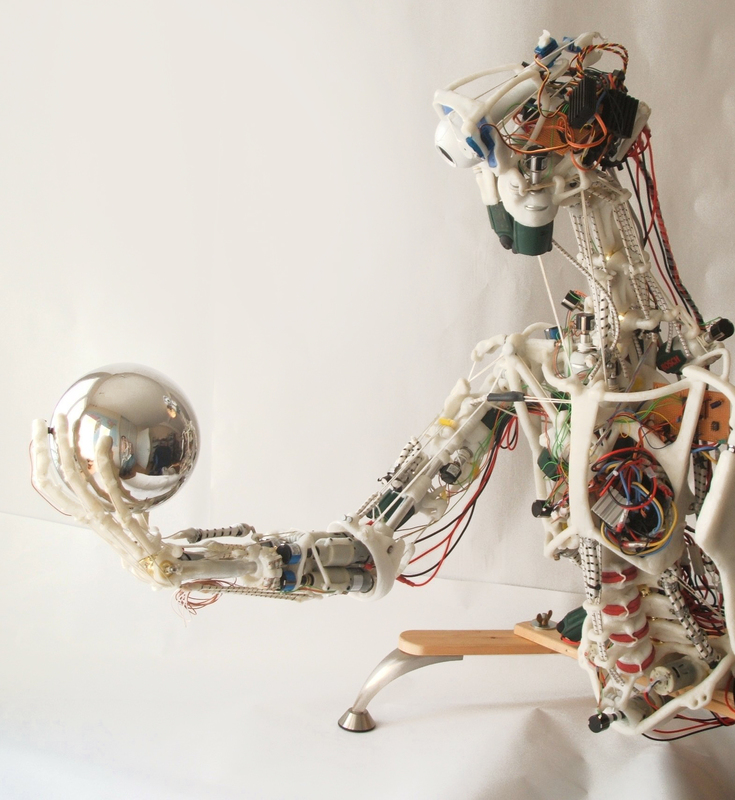 9.13 You may exercise any of your rights in relation to your personal data by e-mailing us at info@therobotstudio.com. 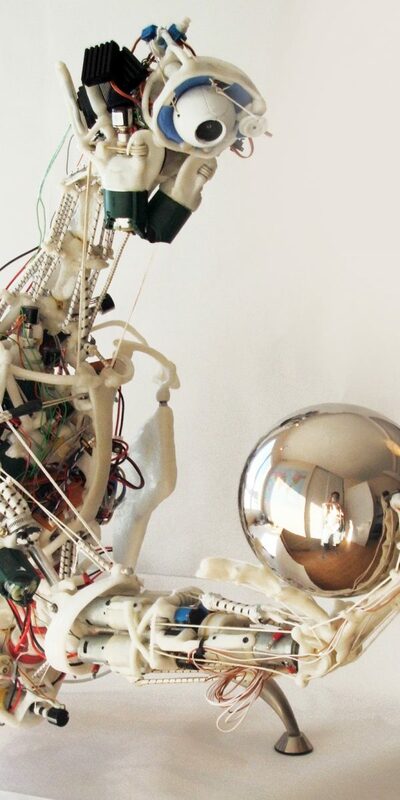 19.1This website is owned and operated by THE ROBOT STUDIO. 19.2We are registered in France under registration number 510222664 and our registered office is at Bel Air Camp, 11 Avenue du Bel Air 69100, FRANCE. 19.3Our principal place of business is at Bel Air Camp, 11 Avenue du Bel Air 69100, FRANCE. 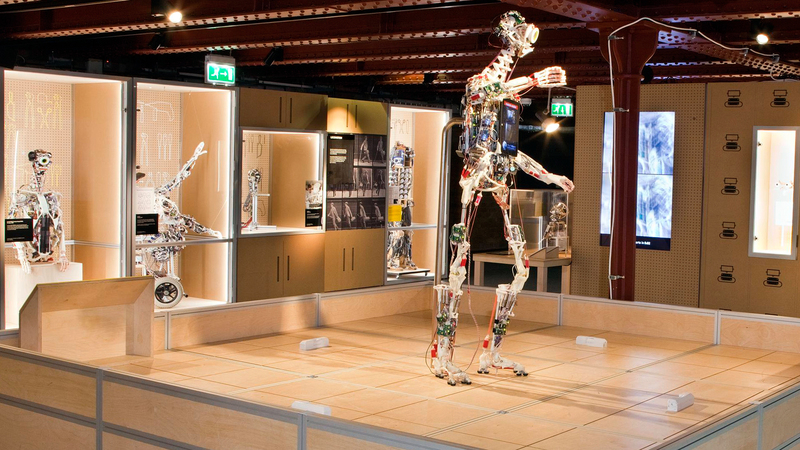 The Robot Studio is a highly-specialised designer and manufacturer of biologically inspired robot hardware. 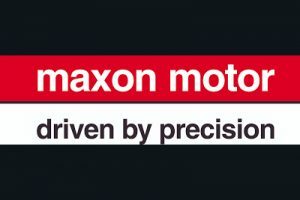 Our technical development centre is based in Lyon, France.